Medical experts have said that black pepper mixed with carcoman is beneficial for protection of brain muscles. 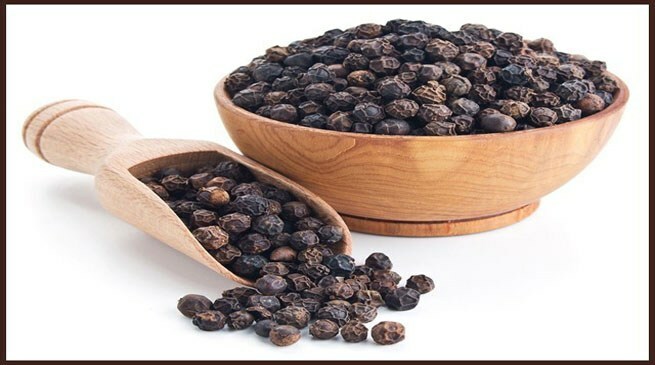 They also said that products present in black pepper is beneficial for reducing weight and beside this it play an important role in protection of many diseases like cough and cold, heart and many diseases. They also said that use of black pepper is useful to prevent from breast, skin and stomach cancer. If you are suffering from cold, drink warm milk mixed with black pepper. If you get cold frequently then increase the quantity of black pepper from 1 to 15 till fifteen days and then reduce one by one, like this your cold will vanish in just one month. In case of cough take half spoon black pepper powder with one spoon honey 3-4 times .Cough will become fine. For problem of gastric in one cup of water mix half lemon juice and half spoon black pepper powder with black salt and drink this it will help in gastric related problems. The throat opens with tasting black pepper mixed with ghee and sugar your voice becomes sweet. Doing gargle with 8-10black pepper boiling in water solve throat problems. Chew raisins with black pepper 2-3 times if you have stomach worms problems. The worms also die by drinking one glass of buttermilk with black pepper powder. If you are fed up of Teeth disease like pariya and your teeth becomes weak then mix black pepper and salt and rub in your teeth quickly you will feel relive. Mix 20 gram of black pepper, 10 gram cumin and 15 gram sugar. Boil this and drink morning and evening with water it will help in piles problem.